Liverpool returned to the top of the Premier League table with a 3-1 victory over rivals Manchester United on Sunday afternoon. The Reds took the lead through Sadio Mane before Jesse Lingard levelled the scores in the first half. Jurgen Klopp’s men continued to dominate in the second half and made it count thanks to two deflected strikes from Xherdan Shaqiri. Eagleseye Footy took a look at some of things you may have missed from a busy afternoon at Anfield. Marouane Fellaini has often come to United’s rescue late on in games this season but there was no danger of that happening at Anfield. 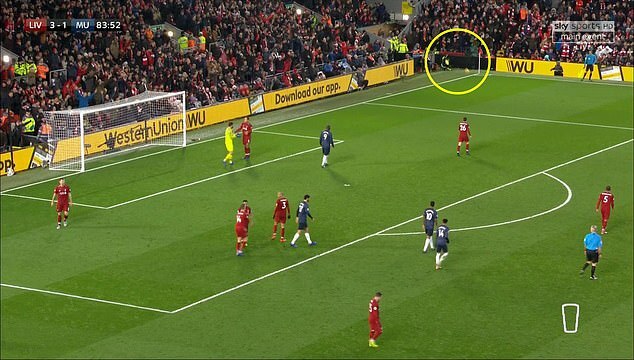 The Belgium international left fly after chesting down a long pass into Liverpool’s area but scuffed his shot awfully, the ball swerving into the path of a steward sitting behind the corner flag. They took evasive measures, trying to block the ball from hitting them with a leg but the effort ultimately knocked him off his seat. It summed up a miserable afternoon for United. Eric Bailly started the game at Anfield but that was not supposed to be the case. The defender was originally named on the bench with Chris Smalling in Jose Mourinho’s starting XI. However, that all changed minutes before kick-off as Smalling picked up an injury during the warm up. In came Bailly with Phil Jones taking his spot on the bench. The visitors would have known they would have to do plenty of defending on Sunday afternoon but Jurgen Klopp’s men came out of the blocks faster than anyone could have expected. The Reds completely dominated the game from the outset, recording nine shots in the first 20 minutes while United managed just one. The home side also had five corners in the same time before Sadio Mane finally made the breakthrough with their 11th effort on goal in the 24th minute. And Mane’s strike was a very welcome one both for the team and the player. 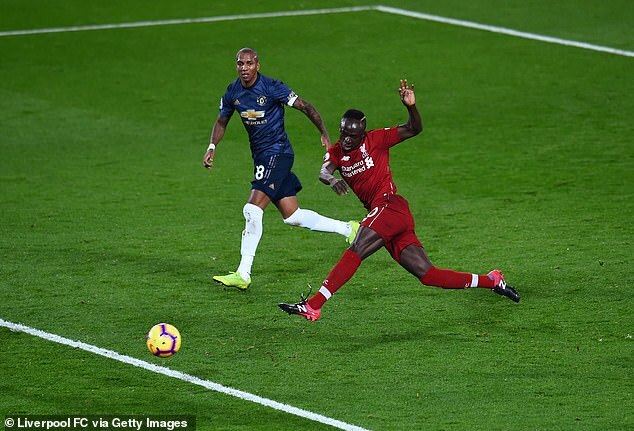 The Senegalese winger ended his goal drought when he controlled Fabinho’s ball in the box and fired past David de Gea. The strike ended a run of eight games without scoring for the 26-year-old, his longest run without a goal for the club. He also became the first Liverpool player to score at home in the Premier League against Manchester United since Daniel Sturridge in March 2015. New Liverpool goalkeeper Alisson has had a fine start to life in England but the Brazilian found himself coming under fire after gifting United a goal in Sunday’s high-profile clash. 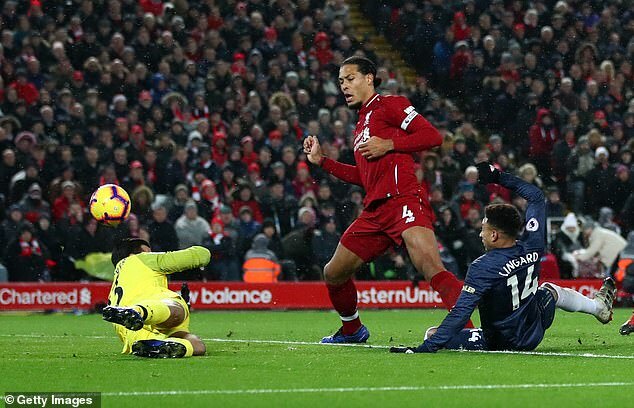 The Red Devills got an undeserved equaliser when the second most expensive stopper of all time spilled Romelu Lukaku’s cross straight into the path of Jess Lingard, who finished into an empty net. Fans quickly took to social media to criticise the former Roma man, pointing out that it was his second goal-gifting error of the season. He previously allowed Leicester a way back into the game when he was dispossessed in the box during a 2-1 victory in September. It means Alisson now has as many key errors as Simon Mignolet and Loris Karius combined last season. Bernd Leno and Asmir Begovic (3) have made more this term, Alisson responsible for 4% of all the errors leading to a goal in the Premier League. The three goals conceded on Sunday mean Mourinho’s men have now shipped more goals in this season’s Premier League campaign than they did in the entirety of last season. The Red Devils were a tough nut to crack last term, shipping just 28 goals in 38 games. However, they have looked anything but solid at the back this time around, letting in 29 in their opening 17 games.